Gyanparab Has Published Current Affairs One Liner of Last month in single PDF. In this file you will find most recent 700 Plus Current affairs one liner for upcoming GPSC Dy.Mamlatdar And Police Constable exam. So download It And Prepare Better. Shikshanjagat Is One Stop Destination For All Kind Of Study Matreial. 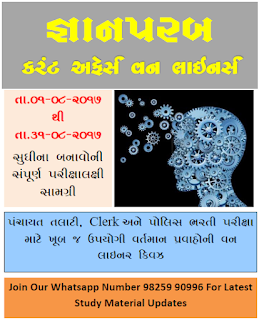 Shikshanjagat Is Providing Daily Current Affairs In Gujarati And English, Online Tests, General Knowledge PDF Files, Educational Updates, CCC News, Exam Notifications, Results and lot more things. So Stay Connected to us for Latest Study material.